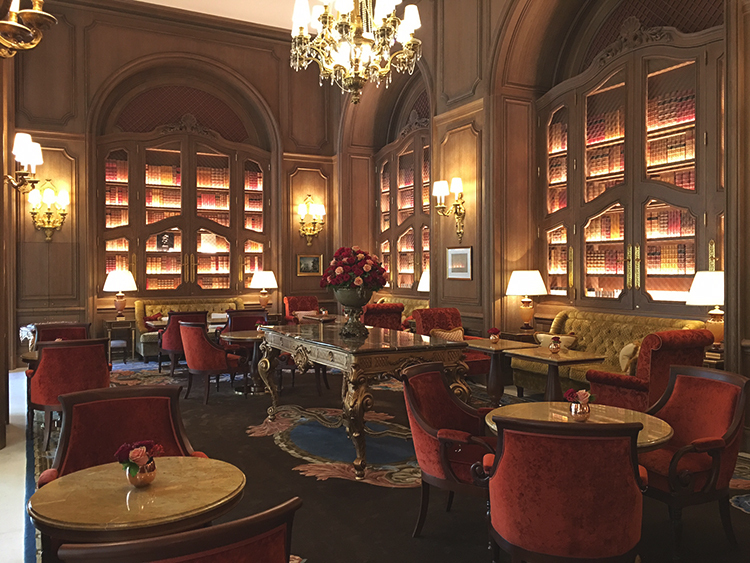 Ritz Paris: The world’s finest hotel? There's a certain elegance about white flowers, especially white roses and hydrangeas set against topiary. 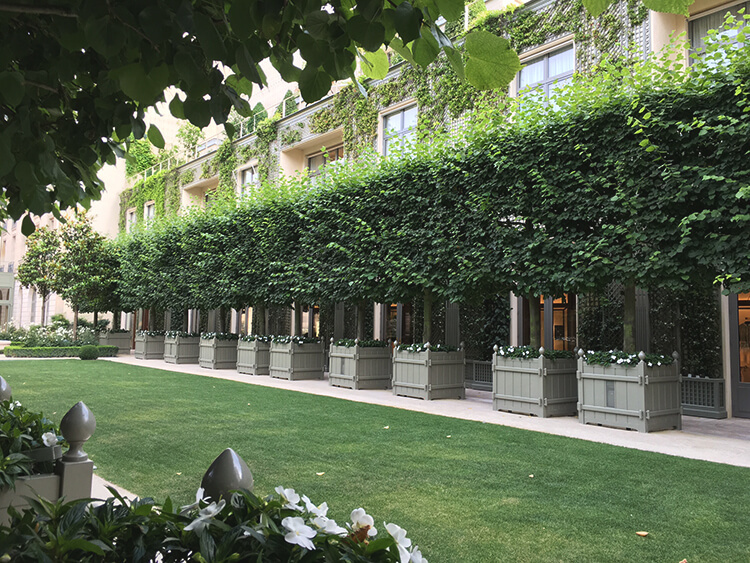 Designer Jean Mus has created a beautiful new formal garden for Ritz Paris along one side of the gallery of boutiques. It is a triumph in urban landscaping. It is a triumph in urban landscape. A long rectangular lawn bordered by avenues of pleached Italian oak trees in large Versailles-styled containers, a profusion of white roses and begonias, with small ornamental pools and fountains at either end of the rectangle. Alcove-recesses make for a delightful spot to relax in what is a very calm and peaceful ‘rus in urbe’. It is a pity that there is no service out here in what would be the perfect place to enjoy a glass of champagne on a warm day. After a closure of more than three and a half years, Ritz Paris reopened on June 6 2016 following a multi-million dollar revamp. The New York Times reports the cost as $224 million US but according to Ritz spokesman Matthieu Goffard it was much more. Wall Street Journal puts it in the region of $450 million US. Whatever the cost, it looks and feels very much the same as before. We understand that this was the intention – as if it has been refitted for those seeking times past. There are changes, some immediately apparent, but most are subtle. ….is it all too safe? The questions we ask ourselves are: is it all too safe? Do we really want those gilded swans-head taps we couldn’t wait to see the back of some years ago? Do we like the colour peach for towels and bathrobes? Taste is subjective and many Ritz aficionados will rejoice in the fact that so little appears to have changed. ….the Ritz is just as it always has been, only sharper. As you step out from your limo to the Place Vendôme, arguably the most beautiful location in Paris, the porticoed entrance of the Ritz is just as it always has been, only sharper. New white canopied blinds; the doormen’s uniforms, the best of any we have seen in Paris. Inside, in what is a lighter space, the blue and gold carpeted corridor beyond the lobby is immediately familiar. To the right, reception and concierge desks, to the left, the Bar Vendôme. Much of the original paved patio is now taken up with a neo-Victorian styled, teal-blue conservatory accented by black ‘street style’ lamps, with vast potted ferns concealing outdoor heaters. This provides a year-round, inside-outside, all-day dining venue maximising on table count, but the design and detailing is incongruous with the rest of the hotel’s style. At first glance it seems more luxury chain hotel than privately owned palace. The sumptuous furnishing style…. is timeless and elegant. Across from Bar Vendôme, an elegant, pine-panelled library (the Salon Proust, open from 2.30–6pm) is set back from the main gallery. The sumptuous furnishing style, with buttoned and pleated damask and velvet upholstery, Louis XVI desk, ormolu wall lights and classic floral display is timeless and elegant. Surprising to see faux books on the shelves but, nevertheless, this is a perfect place to relax and retreat from city life, to read or maybe take an afternoon tea. At the far end of the main gallery foyer, L’Espadon, the Ritz’s main restaurant, is supremely soigné, perfectly refreshed and immaculately appointed. A large area of the formal paved garden has been glazed over with a conservatory matching that at Bar Vendôme. It provides an informal dining room extension, where lighter dishes are served throughout the day; named Les Jardins de L’Espadon, it is reminiscent of the kind of room you find in extended country house hotels. …supremely soigné, perfectly refreshed and immaculately appointed. Beyond L’Espadon the long, narrow gallery of boutiques and showcases is slicker than before, lighter and altogether more inviting. Glazed doors along one side open onto the new garden, with a retro-inspired soundtrack gently playing jazz and lounge music. The gallery includes a number of Italian fashion names yet would have lent itself better as the perfect showcase for top French heritage brands. Colin Field, often referred to as the world’s best bartender. At the end of the shopping gallery a sitting room lobby-lounge area gives way to the world-famous Hemingway Bar, presided over by master mixologist Colin Field, often referred to as the world’s best bartender. It is small, intimate, wood-panelled, with only the lights and curtains having been replaced. We love the memorabilia, including handwritten letters from Hemingway to his wife on Ritz-headed notepaper. Cocktails are excellent, although pricey, starting at 30 euros. But this is the Ritz after all and they do juice the tomatoes freshly for each Bloody Mary (a Hemingway favourite). Opposite is the Ritz Bar for those not lucky enough to secure one of the few coveted tables or bar stools at the Hemingway or at times when the intimate space becomes too animated. We had very high expectations of the first Chanel Spa and imagined it was going to be magnificent and fully Chanel in every way, but it fell short of our expectations. The spa is still branded the Ritz Club and neither looks nor feels much different from before, other than the area dedicated to beauty, which is managed by a team of Chanel-uniformed therapists. This features the Chanel collections of skincare and cosmetics, etc. A pair of semi-circular black wrought-iron balustraded staircases sweep down to the pool area where white sun loungers are laid out on the white-marble floor around the neo-classic pool. The treatment area bears some of the Chanel trademark with its black and gold decor. We had expected more branding, more of the full Chanel experience. The concierge desk at the Ritz is as impressive as it has always been – maybe more so. Concierge supremo Georges Gharbi still presides although he was not on duty during our stay. We asked for directions to a restaurant. The staff were exceptionally helpful and efficient. After we had left the hotel with a detailed map one of the team came running out onto the Place Vendôme to propose an even quicker route. This was impressive. Our suite was in many ways quite regal, living up to the grandest of grandes-dames status. Pale panelled walls, chandeliers, classic ormolu wall lights, antique tables, lots of damask, etc. Yet there was nothing remarkable, nothing that we haven’t seen before in other Paris palace-status hotels. It was supremely comfortable and luxurious. However, the gilded control touchpad by the side of the bed, with its inset jewelled button, controlling the air-con, lighting and heating, was not terribly efficient; we found this slow to operate and difficult to adjust the lighting. Room service and housekeeping executed everything efficiently. A pot of coffee arrived within five minutes of order, the smartly dressed butler, white napkin draped over one arm, addressing us by name, the service polished and discreet. Energetic new and relatively young General Manager Christian Boyens, who we remember fondly from The Peninsula Beverly Hills in Los Angeles, is intent on rejuvenating the style and image of the hotel. However, it is still long-time head honcho Frank Klein, above him, who reigns supreme. It is Klein who will dictate how this iconic landmark will move forward. Whatever evolves, it was interesting to see that during our July visit, in the difficult period not long after the awful terrorist events took place in the city, Ritz Paris was impressively busy. However, the world’s most famous hotel had only opened a month earlier, with much anticipation and publicity following a long closure. Understandably, everybody is keen to see and experience the new Ritz. The question is: do we like it? The question is: do we like it? The answer is ‘yes and no’. Does it hold the position as number one in Paris palaces? Probably ‘yes’ but with certain caveats depending on who it is for, and when they are visiting, and then it comes down to which accommodation to choose. Contact us to find out the best and to plan Paris Fall 2016 in Nota Bene style. Haute Attitude: Double-Edged Sword Or Secret Weapon?